The first houses built in the Back Bay were located on the north side of Beacon Street, between Arlington and Berkeley, on land north of the Mill Dam that had been filled by 1851. The filling of the Back Bay lands south of the Mill Dam began in the fall of 1857, and the first houses were not constructed until the early 1860s. 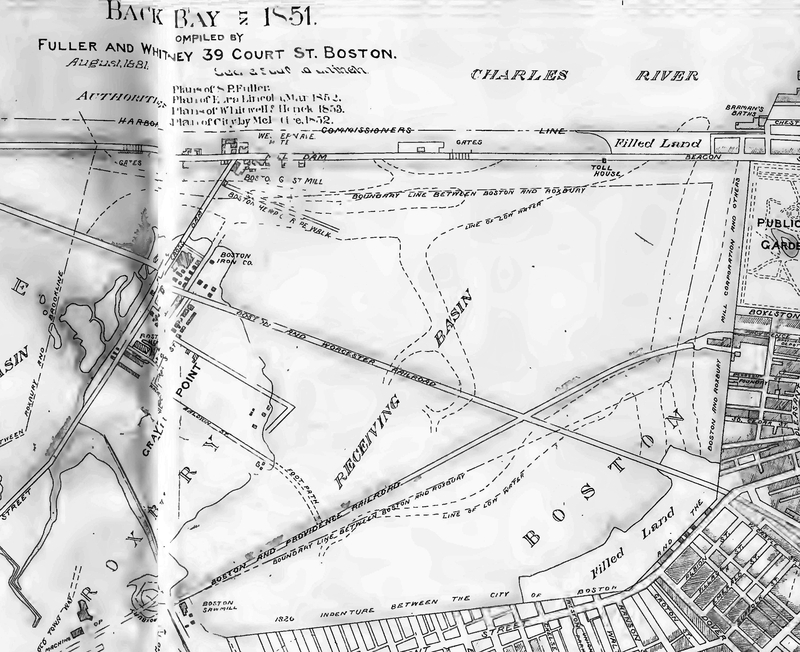 The map to the right, prepared by civil engineers Fuller and Whitney in 1881, shows the Back Bay as it existed in 1851, including the strip of land already filled north of the Mill Dam covering the area now between Arlington and Clarendon Streets. The map below indicates when a building was first constructed on a specific lot through 1859. The dates used are the dates provided in Bainbridge Bunting’s Houses of Boston’s Back Bay. Following the map is a list of the 12 houses constructed between 1855 and 1859. Below is a list of the 12 houses constructed between 1855 and 1859. Houses indicated as demolished were replaced by 2015.